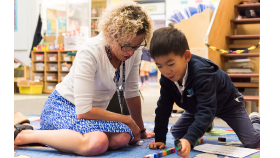 Phillips Brooks School • Preschool through 5th Grade • Menlo Park, Calif.
PBS is a diverse community of families and educators committed to partnering in support of student learning. 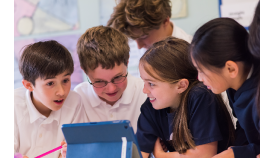 We offer intimate student-to-teacher ratios, ensuring that each child is known and loved by their teachers. Our Early Learning Center program engages our youngest students in creative, play-based, hands-on projects to teach early literacy, math, and problem-solving skills. 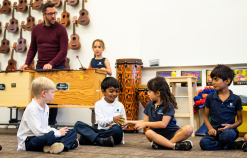 Our innovative, rigorous, and research-based K–5 program blends literacy and math curricula with deep, experiential learning in world languages, visual art, music, and STEM. 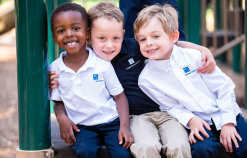 PBS's unmatched Emotional Intelligence program, integrated throughout the curriculum, ensures that PBS students are set up for a lifetime of being eager learners and great people. 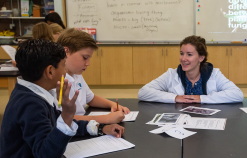 The Admission team will help you complete all the steps required to join our community. On Friday, April 5, PBS teachers, Tanner Taylor and Andrew Cruz, delivered a GATHER talk on "Innovation". 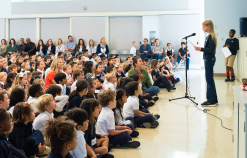 Each week, students in Kindergarten through 4th grade present classroom reports as part of our GATHER assembly. These glimpses into the life of each class are presented by a different student each week.